Reading and share top 13 famous quotes and sayings about Believe In Santa Claus by famous authors and people. Browse top 13 famous quotes and sayings about Believe In Santa Claus by most favorite authors. 1. "All right, so you believe in Santa Claus, and I'll believe in the 'Great Pumpkin.' The way I see it, it doesn't matter what you believe just so you're sincere! (Linus)"
2. 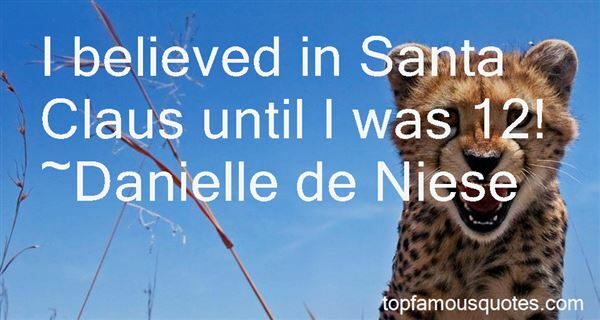 "I believed in Santa Claus until I was 12!" 3. "Not believe in Santa Claus! You might as well not believe in fairies!" 4. "VIRGINIA, your little friends are wrong. They have been affected by the skepticism of a skeptical age. They do not believe except what they see. They think nothing can be which is not comprehensible by their little minds. All minds, Virginia, whether they be men's or children's, are little. 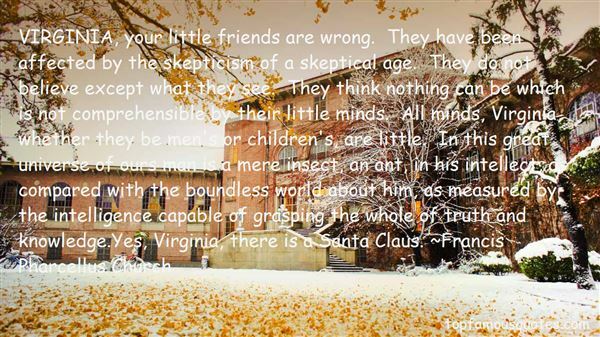 In this great universe of ours man is a mere insect, an ant, in his intellect, as compared with the boundless world about him, as measured by the intelligence capable of grasping the whole of truth and knowledge.Yes, Virginia, there is a Santa Claus." 5. "A theist can't empirically prove that God exists but he believes in God because no one can allegedly disprove God's existence. By his logic, you must believe in anything you can't disprove. That means all things are real until disproved--including the tooth fairy, the Loch Ness Monster, Santa Claus, the Flying Spaghetti Monster, etc." 6. "We laughed about all the kids who believed in the Santa Clause myth and got nothing but a bunch of cheap plastic toys. 'Years from now, when all the junk they got is broken and long forgotten,' Dad said, ' you'll still have your stars." 7. "Several centuries ago it was believed that the fly agaric, combined with the bufotenin–containing mucus of toads, was an ingredient of witches' brews, which made flying on their broomsticks possible. 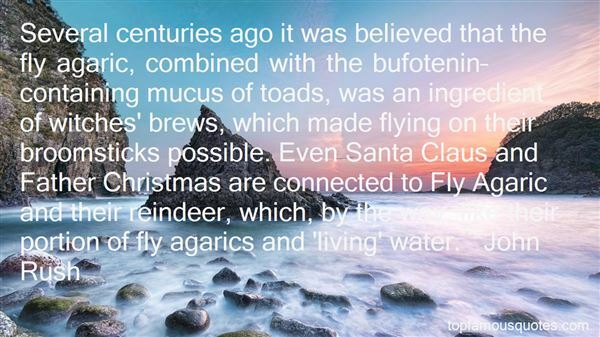 Even Santa Claus and Father Christmas are connected to Fly Agaric and their reindeer, which, by the way, like their portion of fly agarics and 'living' water." 8. "Believe in love. Believe in magic. Hell, believe in Santa Clause. Believe in others. Believe in yourself. Believe in your dreams. If you don't, who will?" 9. "I came to understand that belief is a preconception about the way reality should be; faith is the willingness to experience reality as it is, including the acceptance of the unknown. An interesting way to understand the difference is to use the words interchangeably in the same sentence: I believe in Santa Claus. I have faith in Santa Claus. Belief can impede spiritual unfoldment; faith is supremely necessary for it." 10. "I hear that in many places something has happened to Christmas; that it is changing from a time of merriment and carefree gaiety to a holiday which is filled with tedium; that many people dread the day and the obligation to give Christmas presents is a nightmare to weary, bored souls; that the children of enlightened parents no longer believe in Santa Claus; that all in all, the effort to be happy and have pleasure makes many honest hearts grow dark with despair instead of beaming with good will and cheerfulness. "A Plantation Christmas," 1934"
11. "Grown ups don't believe in Santa Claus. They vote." 12. "So you don't really believe in love?" I whispered. How could this be? I was crushed. It was like finding out the truth about Santa Claus and the tooth fairy and the Easter bunny in one sitting." 13. "You can make a child believe a lot of things. Santa Claus, the Tooth Fairy, the Easter Bunny... just about anything really, except love. You cannot make a child believe you love him if you don't"
Death means nothing to men like me. It's the event that proves them right."